I was originally going to share money-saving tips from The Great Depression, but when I mentioned that to my 90-year-old grandpa he laughed and said, “What money?”. So I switched gears and have come up with something a little bit different. As mentioned earlier, I sat down with my grandpa to discuss life during the depression. He was number 3 of 9 children and grew up on an 80 acre farm in Arkansas. He told me that life was full of hard work, but also strong community. He said that people were closer than they are today. I think that is probably true since hard times tend to bring people closer together out of necessity. A strong community is a great thing and so I wondered what other positive qualities people had to have in order to survive and maybe even thrive during the Great Depression. 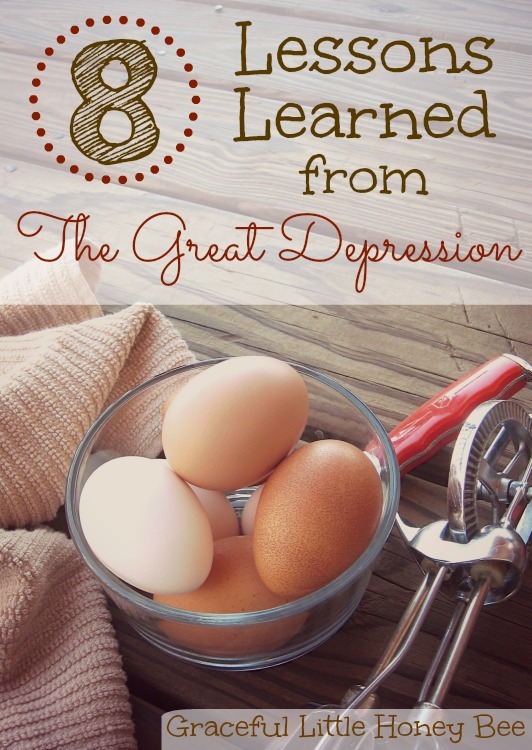 So here is a list that I came up with of Lessons Learned from the Great Depression. Frugality is simply not letting yourself spend that which is not necessary. Obviously, during the depression money was scarce so frugality was the only option, but having this quality probably helped people get through the hard times with a grateful heart. If more people adopted this quality in their lives today then they would be a lot better off and you can bet that teaching frugality to the next generation would save them from a world of bad financial decisions. Resourcefulness is the wise use of the material possessions that we have been given, even that which others may overlook. You can bet that everyone was resourceful during the depression because they knew that their resources were limited. This character quality would be a breath of fresh air in our throw away society today. Industriousness is having a firmness of purpose with constant diligence and attention. Basically a person who is industrious lives with a purpose in mind and sets his mind to accomplish it. It’s a person who is almost always busy learning, creating or working on something. This was of great importance during the depression because it took a lot of energy and industriousness just to survive. Endurance means having the strength and focus to keep pushing forward. This was a crucial quality to have during the depression. People didn’t know when things would get better, but they probably tried their best to push forward toward what the future might bring. When creativity and resourcefulness come together great things happen. Knowing how to fill a need with minimal resources takes great creativity and I think people were probably forced to practice this skill during the depression. This is a skill that the current generation is lacking because we have everything we need all the time and I feel it is a great disadvantage to us. After all, necessity is the mother of invention. When someone is determined you had better watch out because they will probably reach their goals with great gusto! I can’t imagine how parents during the depression were probably determined to feed their families and keep their homes full of hope instead of despair. This was probably a hard quality to maintain, but the ones that tried to practice it were blessed in the long run. When hard times come, things are bound to change and those who embrace the change will flourish. Flexibility was probably key during the depression because husbands were out trying to find work and didn’t know where they would end up. I think being willing to try something new when you need to is a key survival skill. Being grateful and content is probably one of the most important keys to happiness during the depression. Those who focused on what they had and how blessed they were probably had more opportunities come to them than those who complained and moped around because they didn’t have something. Again, maintaining this quality was probably a struggle, but worth it in the end! The Great Depression was a time of need and scarcity, but I believe many families flourished because they worked hard and were grateful for what they had. Thinking about the Depression makes you realize the that the most important things in life are not money or material possessions, but relationships and memories. I read a lot of money saving blog posts and I think this is one of the best I have read! I LOVE that you focused on the character qualities...the post inspired me! Thank you. What a wonderful compliment. Thank you so much! You really did touch on the sentiment and feelings of "the greatest generation". It is refreshing to find someone as young as yourself who understands the importance of our ancestors struggles. Thank you for all that you do to make the world a better place. It is definitely a good thing to learn from the past! This is such great advice - thank you for sharing! I think we all need reminders to be humble and grateful for everything we have, it's hard to even imagine how difficult times were during the Great Depression even though there are still plenty of Americans alive who survived that time. It's rare to see a blog discuss heavy issues like this, so thanks for being bold and writing this all down. I am so glad that you enjoyed it Liz! It's my hope that it will cause people to pause and appreciate what they have a little bit more. This is a good post. My parents were raised during the Depression and they have shared their stories with me and I know that they lived like they lived during those times. Even after the Depression was over most of the people in our area had to still live in hard times. My mom and dad were raised during the Great Depression. Both of there families were large. Both from different parts of the united states. They had 8 kids and my mom didn’t work but worked hard using the land they had. I am the youngest and was lucky to have both parents around, but my dad worked when my older brother and sisters were being raised they had different stories to tell about what life was like for them. We had a lot of land so my mom and dad had large gardens (all kids of veggies). My mom and the kids canned. They dried and put away so much food. My mom was up early cooking making sure everyone had 3 good meals a day. We only went to the store once or twice a month for only what was needed. Mostly flour, sugar and things like that. We raised chickens, pigs, goats and ducks. My dad and brothers hunted and fished. We had lots of woods on the property and they cut plenty of wood and they sold wood for extra money Best way to do this is to make sure if a tree went down another took its place. We gathered wild berries, had fruit trees (apples, peaches, plums, pears, figs and blueberries. Canning was a part of life and if you didn’t do it you didn’t eat most of the time. So when my mom canned hundred or more jars of each thing kind of veggie and fruits. We had a building that we stored the can goods in. Biggest part of being a person during hard times was if you had too much you shared. If you knew someone that needed food then you worked it out so they can share what you have. My mom and dad always made more than we needed. People were proud and if you knew they needed something then you made a trade. Sometimes it was the only way that person would take what they needed. I wish people helped one another like when I was being raised. Where everyone was grateful for what they had because there were so many that didn’t have as much as we had. The kids played out in the yard and did what was needed to help their parents and their other family members. Making sure grand parents and aunts and uncles had what they needed. You help everyone that is how people made it through the hard times. Thank you for sharing you experience Karen! It sounds like your family worked hard and knew how to survive. This is inspiring, touching , I just love your pin, thank you very much for sharing. That's a lot of great options! Because of the c-o-r-p-o-r-a-tions; people are Mislead into thinking, there is Not enough resources/material things, to go around. But it might Be like that in certain areas, cause for example: over mining etc. etc. But by and large, as you"ve said: people now adays have everything. I would say a lot of people do, but not everyone! I'm guilty of over consumption too; but Not on purpose... I then pared things down cause, I didn't need so much. Your right: money isn't that important. But GOD gave us tons of resources; so why not have what all of us, reasonably need or want? What is really wrong; is we allow others to own those resource$ and don't give us any, unless we have a piece of paper... I agree we should live frugally, and live reasonably without getting Extra, we really Don't need/want. Your nuggets of wisdom have got me thinking. Thank you little bee.